Back in the day the retro Magic Cards were a bit different from what the game has become today. I remember getting my first starter pack of Revised way back in 3rd grade. Thats 1994! Over twenty years ago. Recently, out of nowhere, I was overcome by an extreme nostalgia for the old 90s magic cards. 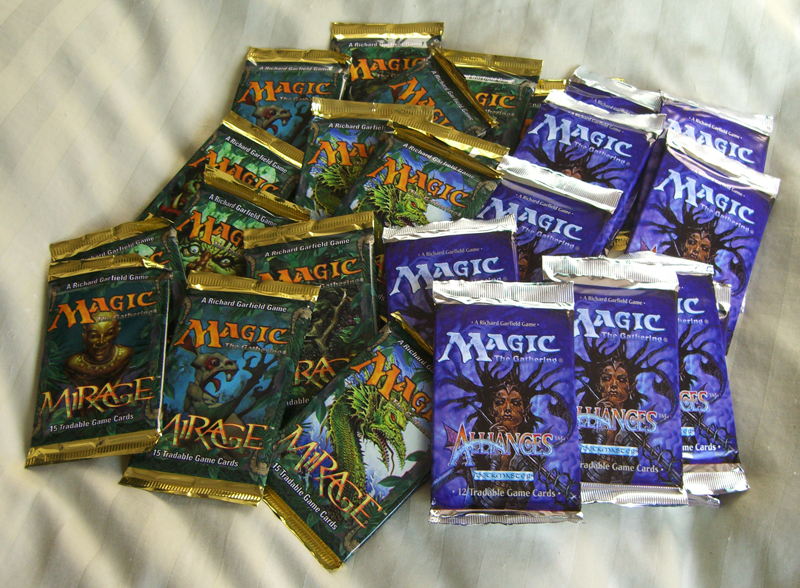 In Magic The Gathering a Draft is a tournament where players each open 3 or 4 booster packs to create a playable deck. Each player chooses one card from the booster and passes the pack to the left. This process repeats until all cards have been chosen. Then the next pack is opened and the process is repeated again. Each player has to create a deck with at least 45 cards including mana (separate from the boosters). There can be a prize for the winner of the tournament, or not. It's fun either way. So the simple conclusion is that next time I see some of my childhood friends we're bustin' open some retro MTG packs and playing a draft! 2016: Time to do it again! Well, it's about a year and a half later and I'm itching for another session of a 90s throwback Magic the Gathering draft. 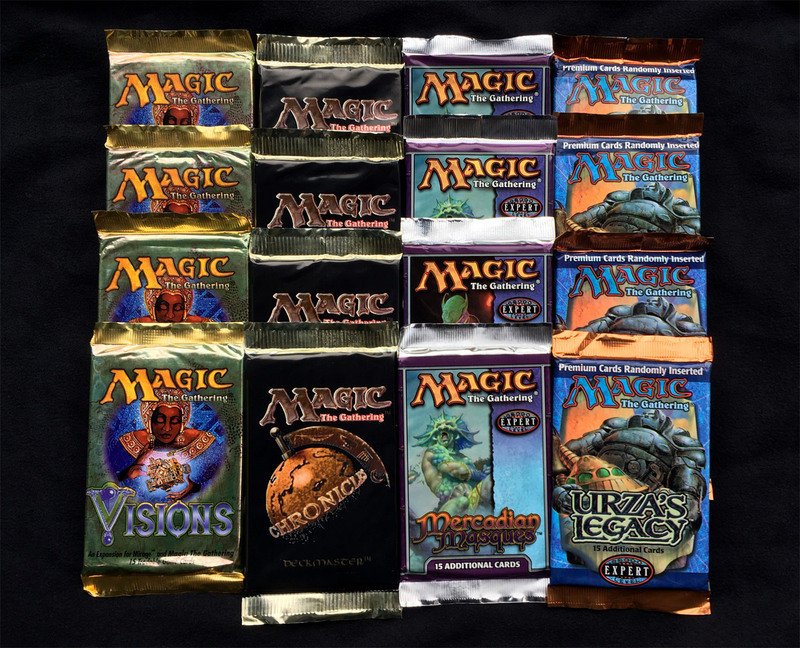 This time I bought 4 of each pack: Visions (1997), Chronicles (1995), Mercadian Masques (1999), and Urza's Legacy (1999). 4 players, 4 editions, 1 pack from each edition. Each of us will create a new deck with a minimum of 45 cards and wizard-battle-it to the death. Should be an epic draft! I just can't get enough of this stuff! It's 2017 and once again we busted open another sixteen really old, really awesome, Magic boosters from the 90's and early 2000's! We're talking the 4th Edition, Ice Age, Visions, Stronghold, Exodus, Weatherlight, and Nemesis editions. In 2015 we split the sixteen pack draft into two editions. Then in 2016 we did four packs of four editions. Are you seeing a pattern here? This year we did two of a kind. Which made the draft a bit dicey. Each player only got to open and pick the first card from four of the eight available editions. 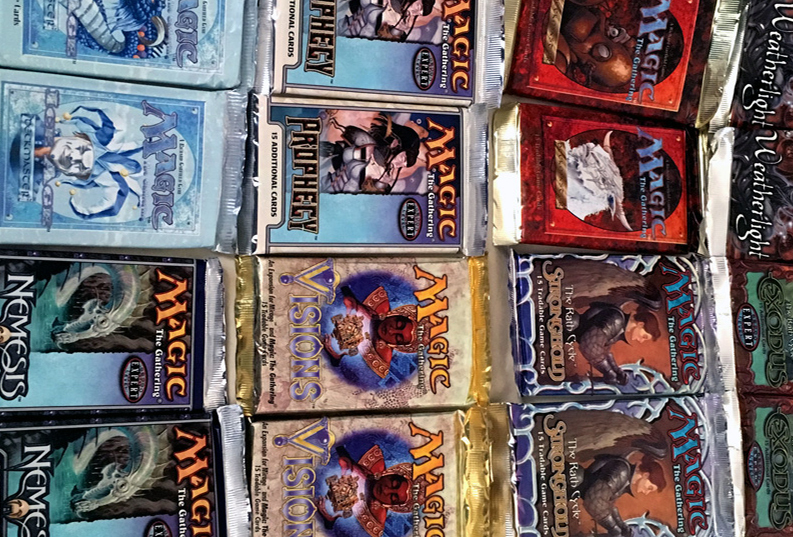 The 4th edition packs were highly sought after for the slim chance someone might grab an essential card, perhaps a Dark Ritual or Lightning Bold. Accompanied by my lovely wife and two of my best friends we methodically engaged in another killer Legacy Magic The Gathering Draft. I drafted Blue & White deck and we played an epic four person wizard's duel to the death.